Did you know April is National Jazz Appreciation Month? This month, North Texas is celebrating the beauty of jazz as both a historical and current form of art through a variety of fun events! From concerts, to award shows and nights out on the town, you can join other North Texans and celebrate all that jazz has to offer while you #RideDCTA! From London to New Orleans, Seattle and now in Denton, Australian jazz singer, Michelle Nicole, will perform a night of charming jazz in sponsorship with UNT’s College of Music. Michelle Nicole, an arranger, bandleader and award-winning jazz vocalist will perform at 8 p.m. on Saturday, April 6, at the Murchison Performing Arts Center on UNT’s campus. Tickets range from no cost to $10. Ride our Mean Green Night Rider campus shuttle to get there and claim your seat! For more information, visit calendar.unt.edu/jazz-singers-jennifer-barnes-director-guest-artist-michelle-nicolle-0. Enjoy a hot cup of joe while listening to some jazz! The Jazz Heads, a jazz group from Denton, will perform from 7 p.m. to 9 p.m. on Friday, April 19, and Friday, April 26, at the Perc Coffeehouse in Lewisville. To get there, take our Lewisville Connect Route 22. For more information, visit lewisvilletxlive.com/event/various-artists-at-the-perc-coffeehouse/. 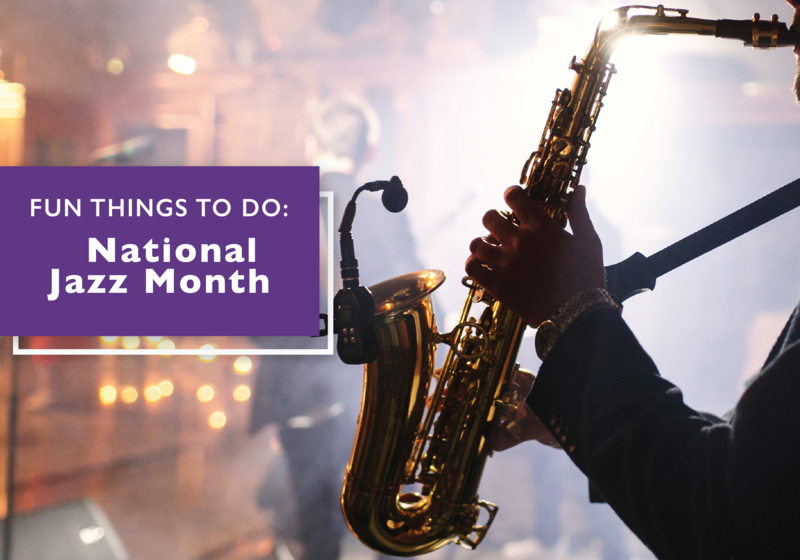 Want to celebrate National Jazz Appreciation Month in a more active way? Take a jazzercise class! It is a fun way to get your heart pumping to a funky, jazz playlist. Try your first class for FREE and with classes offered all day, maybe you’ll find a new hobby you love! Ride the Highland Village Connect Shuttle to get to the Jazzercise Flower Mound Fitness Center. For more information, visit local.jazzercise.com/jazzercise-flower-mound-at-the-center/Highland-Village-TX/. Spend this month with others who have a special love for jazz! Mark Allen Duo, a seasoned jazz musician with more than 30 years of musical experience, will host a FREE live concert at the Witherspoon Distillery in Lewisville on Saturday, April 27. From 6p.m. to 9p.m., the well-versed musician will entertain the crowd with classic jazz as Witherspoon Distillery bartenders serve your favorite hand-crafted cocktails. To enjoy a night of smooth tunes, ride our Lewisville Connect Route 22 to get there. For more information, visit witherspoondistillery.com/events. Celebrate the beautiful sounds of jazz at one of the largest local attractions for the finest entertainment and art in North Texas! The Denton Arts and Jazz festival will run from Friday, April 26 (from 3 p.m. to 11 p.m.), Saturday, April 27 (from 10 a.m. to 11 p.m.) and Sunday, April 28 (from 11 a.m. to 9.m.) at Quakertown Park. There are activities for everyone – from a Children’s Art Tent to six food courts with unique cuisines, art exhibits and of course, live jazz! Ride our FREE shuttle service each day of the festival from MedPark station and Texas Health Presbyterian Denton directly to the festival grounds. For more information, dentonjazzfest.com/. Which events do you plan to attend this month by riding DCTA? Let us know in the comment section below!